Getting you ready for tomorrow, today! We are living in a time of unprecedented change. Every industry, market or sector is confronting disruption, making it increasingly difficult to predict the future. In such a shifting landscape, the solutions aren’t always obvious. And yet, our expectations have never been higher. The demands on leadership are increasing. The pressure to perform is unparalleled. What can we do to stay relevant in a such a complex world? How do we make sustainable, meaningful progress in the face of so much uncertainty? To thrive, we need to find a way to navigate this complexity. Practical tools to find clarity. Pragmatic and purposeful steps to identify, harness and leverage the unseen opportunities. Cool, calm and collected when dealing with the challenges of today. Bold, brave and balanced in the face of future disruption. We must learn to love change, to deepen our decision making and get comfortable embracing the unknown. I show forward thinking leaders, executive teams, and large-scale organisations how to do just that. How to empower people to thrive through complexity, unlock greater awareness, and make powerful, wise and congruent choices. Choices that better serve their colleagues, organisation and career. This is the work that matters, the work I’m good at and the work I love. I help people, teams and organisation get ready for what the future holds, today. So they can step ahead, step up and leap into their brilliant future. Using expert designed facilitation Michelle helps organisations and teams secure greater team engagement, enhanced capability and strategically aligned decisions. Michelle supports forward thinking executives to shift their thinking, elevate their ability to connect and engage, and enhance their career outcomes. As a leading expert in complexity and transition, Michelle inspires audiences to think more deliberately, accelerate progress and take action to secure sustainable change in their personal and professional lives. 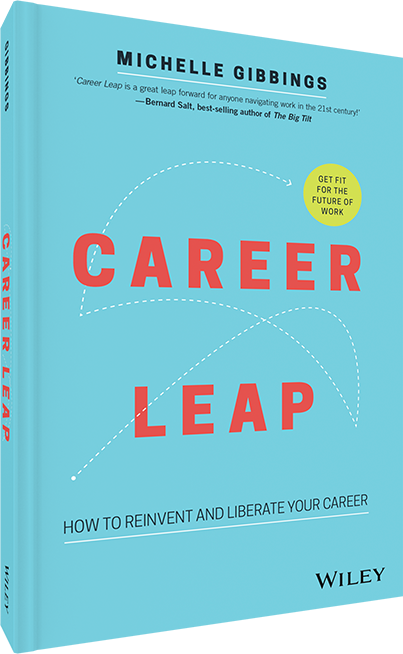 Career Leap is a great leap forward for anyone navigating work in the 21st century Bernard Salt, best-selling author of The Big Tilt How would it feel to know that you had in your hands all the tools and techniques to land a new career – whenever you wanted it? With the increasing use of automation and artificial intelligence and the rise of freelancing and the gig economy comes enormous workplace change and flexibility, but also less security. You cannot future-proof your job, but you can future-proof your career. Career Leap shows you what you need to know, how you need to change and how you can prepare for the inevitable tides of change.